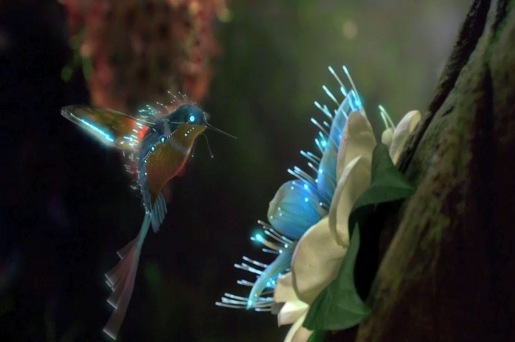 Samsung is promoting the new LED Series 7 television with a television commercial airing worldwide, featuring an animated hummingbird and the new Ultra Slim LED 7. The New Species campaign was developed at Cheil Worldwide by creative director Tom McManus, art director Tom Kane, agency producer Drew Lippman. The spot was developed at 1st Ave Machine by director Arvind Paleep, executive producer Serge Patzak, head of production Hae-Sook Song, producer Crystal Campbell, creative coordinator Claire Mitchell, storyboard artists Ilya Skorupsky and Nate Mulliken. The CGI team included technical directors Sam O’Hare and Dan Gregoras, artists Jesse Holmes and Vlad Streltsov and character animator Rob Dollase. Editors were Eric Lin, Tim Malieckal and Ryan Beickert. Compositors were Weito Chow, Dorian West and Makoto Sato. Live action was produced by Lee Scharfstein, with director of photography Mateo Londono, production designer Michael Shaw, production supervisor Kathleen Handwerk and assistant production supervisor Lian DeMarais. 3D scanning was done by XYZ RGB, Ottawa. See more on the making of the video at Digital Arts. See the video in Quicktime at Motionographer. Agency Cheil Worldwide commissioned 1st Ave Machine to work on the spot, having admired the studio’s previous work, particularly the quirky music video Arvind Paleep directed for indie band Alias’ single “Sixes Last” in 2006.